Welcome to the Red Moon Farm spring CSA. This is a big week of lush, healthy vegetables, so enjoy! Easter Egg Radish—Crisp and bright. excellent raw with a little lemon or lime. Have you tried sautéing radish tops yet? They’re so delicious. We pickled these for our big farm dinner this Saturday. Kale or Collard—Large shares received collard greens, and the small shares received Red Russian kale. These two are very closely related genetically and in flavor, and can often work interchangeably in recipes. obviously this crop is great with bacon and onion, or you could try one of our many kale recipes in the kitchen blog. You’ll see this crop at the dinner this Saturday, as well. Swiss Chard—Large shares received gorgeous leaves of this rainbow swiss chard variety. The leaves are very similar in flavor and texture to mature spinach and beet greens, are great raw or braised or sauteed. This will also be part of Saturday’s farm dinner. Lettuce—Large shares received a romaine and a red butter lettuce. Small shares received a red butter lettuce and a New Red Fire lettuce. Snow Peas—Small shares received a pint of sweet, crunchy snow peas. Next week we hope to switch and offer this delectable item to the large shares. Asian Spring Mix—A wide variety of Asian greens like scarlet frills mustard, mizuna, tatsoi, and more. The bright spice of these mustardy greens pairs best with an animal fat like lard, butter, or bacon fat. Spring onions—These onions began to flower, which means they won’t put any more energy into their root, so it was time to pull them up. The main crop of onions needs several more weeks, but these early onions are pretty sweet and delicious. The bulb, greens, and even flower top are edible- any part that isn’t tough. The many leafy greens will all last longest stored in the refrigerator, sealed up in a bag or container to retain their moisture. The radish roots should be severed from their tops to keep them firm and crisp, and the tops can be stored like the other greens. Everything will need a gentle washing before cooking, but leave the dirt on until you’re ready to use them. As a general rule, wait to wash any veggies until you’re ready to use them to help retain nutrients and prevent spoilage from excess moisture. 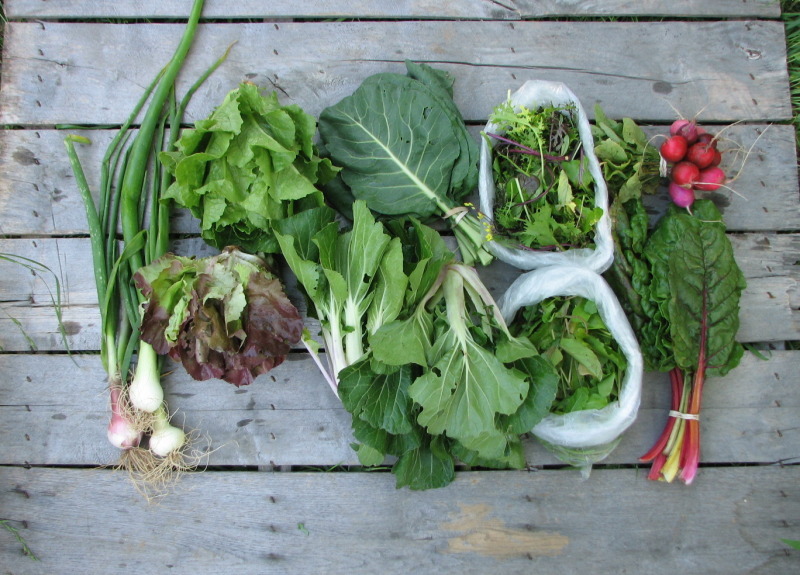 Large Share: Spring onions, romaine and red butter lettuce, collard, pac choi, Asian spring mix, arugula, radishes, and Swiss chard. 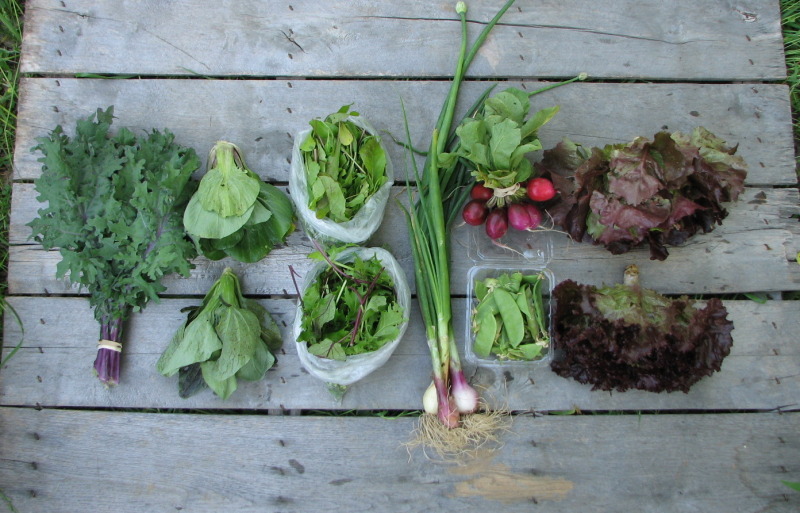 Small share: Kale, pac choi, arugula, Asian spring mix, spring onions, radishes, snow peas, and lettuce. Are both bags in the small share spring mix? No mam! You have one bag of arugula and one of Asian spring mix. Check out the images to help you identify! I just wanted to say the lettuce was almost too pretty to eat! It tasted great, too!